Found myself at Ikea yesterday, and gained some great inspiration for my boys' bedroom. So I came home and pulled together an inspiration board with a few of the items I saw there (and others I've been saving in my files). Thought you all might want to take a peek. I have had my eye on the duvet set at Ikea for quite a while...and it's very reasonable...just $29.99 for a twin duvet and pillow case. Lovin' the blue and white stripes. Then I saw the pretty cable knit blanket and thought it added another nice nautical touch to the bedding ensemble at $39.99. The other Ikea find? That great nautical ceiling pendant. Perfect at $29.99. The rest of the inspiration photos pictured? You'll just have to stay tuned to find out! Can't wait see the real thing! Love this mood board! Can't wait to see it come to fruition. I've been loving that wall of letters photo forever. One day I might try it... heh heh heh. I think your choices are perfect for a little boys room! Great looking - love the bunks, can you share that source, please? Love IKEA!...cant wait to see more...Im working on my littlest' guys room...from Nursery to "room"...sigh. I think this is gonna be a pretty adorable room, Wendy! Are you tackling the built ins then? Love every bit of it. Can't wait to see how you put it all together. Gotta love Ikea! I am really diggin' your inspiration board- there are some wonderful ideas there. Can't wait to see the real thing! Very cute! I love those letters! Boys room plan is fantastic!.. i would like to take your tips here.thanks for sharing. Oh I just love all of your inspiration. I love that light! I didn't see a source for that - do you have one? 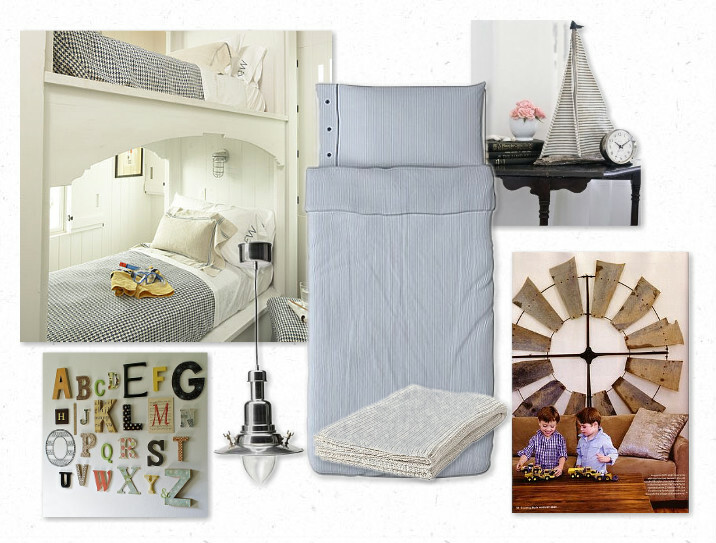 I'm doing a nautical nursery right now, but much more grown up than your typical nursery. Great ideas! !